The Olympic Torch has been a part of the modern Olympic Games ever since the 1928 Summer Olympics in Amsterdam. But it was in 1936 at the Olympic Games in Berlin, Germany that the torch relay first started when a lit torch was carried from Olympia to the site of the Olympic Games through seven countries - Greece, Bulgaria, Yugoslavia, Hungary, Czechoslovakia, Austria and Germany - a total journey of more than 3,000 km. 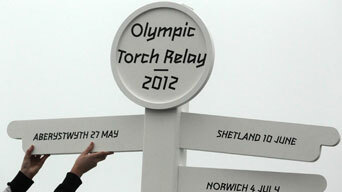 The 2012 Olympic Games Torch Relay took place in the UK from 19 May to 27 July 2012. The torch relay follows the same procedure at every Olympic Games. The Olympic Flame is lit from the sun's rays at the Temple of Hera in Olympia, in a ceremony in the ruins of the home of the Ancient Games. And after a short journey around Greece, the Olympic Flame is then handed over to the host city - in this case, London. The Olympic Flame then travelled around the UK for 70 days, passing from one Torchbearer to another, spreading the message of peace, unity and friendship as it made its way to the Olympic stadium in time for the opening ceremony. The Olympic Flame was lit in Olympia in Greece in May 2012 and arrived in the UK on 18 May 2012 on board a British Airways aircraft. The Olympic Flame reached as far north as Lerwick in Scotland; St Helier, Jersey in the south; Lowestoft in the east and Enniskillen, Northern Ireland in the west. And not only did the route include villages, town and cities, but the 2012 Olympic Games Torch Relay also took in hundreds of UK landmarks such as Snowdon, Stormont, Loch Ness and Stonehenge. The 70-day Olympic Torch Relay started at Land's End, Cornwall on the morning of 19 May 2012 and travelled an estimated 8,000 miles around the UK. 8,000 Torchbearers, each of whom had a story of personal achievement and/or contribution to the local community, carried the Olympic Flame for approx 300 metres and thousands of people welcomed the Olympic Flame along the route each day. Many towns had special events. 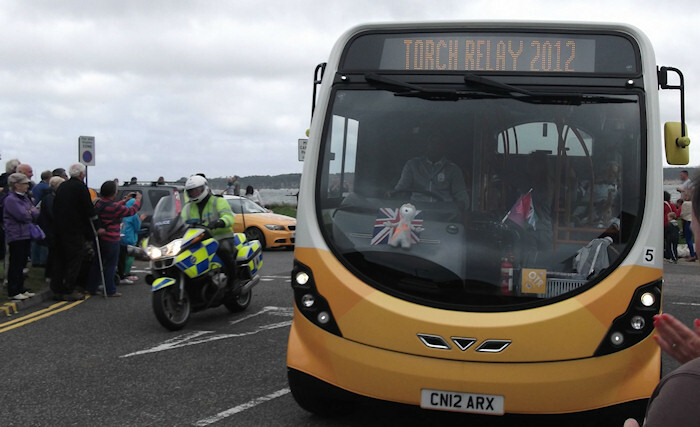 Here are a couple of pictures of the Torch Relay as it went through my town. On the final day of the Olympic Torch Relay, the Olympic Flame travelled down the River Thames as it made its way to the Olympic Stadium on 27 July 2012 for the lighting of the cauldron at the Opening Ceremony, signifying the official start of the London 2012 Olympic Games. The Flame was put out on the final day of the Games, at the Closing Ceremony. So what did people say prior to the torch relay? "I'm delighted that the Olympic Torch Relay will take the 2012 Games to almost every corner of the UK and that we have achieved our ambition to take the Flame to within an hour's journey of 95% of the population. Now everyone is invited to plan their welcome and find out where they can go to be part of this historic occasion. 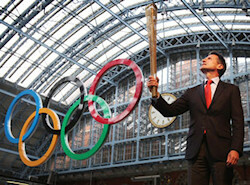 The Olympic Games are coming to you as the Olympic Flame gives our people and places their moment to shine." "When the Olympic Flame arrives here in the UK on 18 May next year it will mark the final countdown to the greatest sporting event the country will host in our lifetime. The Olympic Torch Relay will be an amazing opportunity for people to see the Olympic Flame in their own towns and communities. The Flame's journey is steeped in the rich history of the Olympic Games, travelling from Athens then right around the UK. 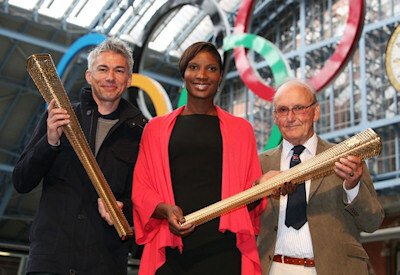 I encourage everyone to get out and take part in the excitement of the Torch Relay as it comes through their town."